We would like to welcome you to our office. We are a ONE STOP DENTAL OFFICE that means we will provide all specialty services at our location. After comprehensive exam we inform you of the Services you need, you and only you decide what to get done, how and when. All at your convenience. No hard sell, No sale pitches and No pressure. We take great satisfaction in helping you maintain optimal oral health. Our practice is devoted to comprehensive and preventive patient care. Interest free and low monthly payment plans are available; subject to credit approval. Throughout our website, you will find an abundance of information about our practice, the pain-free procedures we provide, and dentistry in general. Please explore and learn as much about dentistry and our services as you desire. We believe our patients should have as much information as possible in order to make important and informed decisions regarding their oral health and treatment options. With our patients as our most important asset, we strive to develop long-lasting and trusting relationships with all of our patients. We treat our patients as our extended family. Your referrals are welcome and appreciated. Like us on facebook and follow us on twitter now and get a FREE consultation & Goody Bag! Lion Dr Chander Gupta along with other lions from Dania Lions Club served 100 Students with backpacks filled with school supplies. 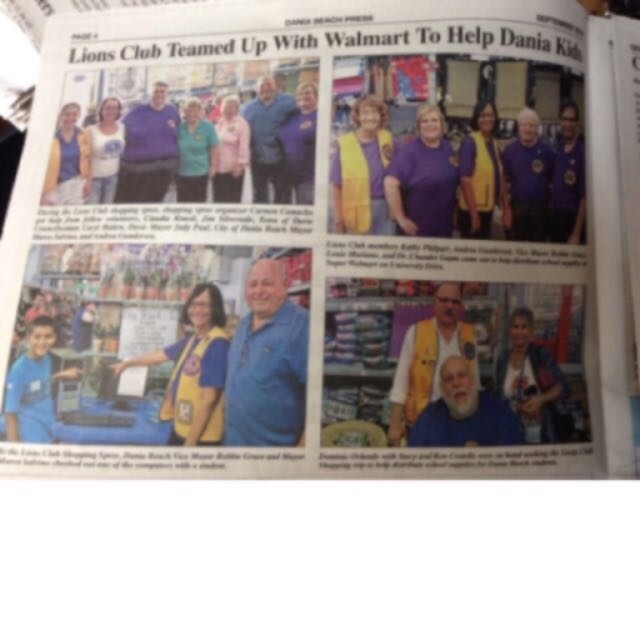 Lion Dr Chander Gupta of Brighten Dental Care along with other lions from Dania Lions Club served 100 Elementary School Students with backpacks filled with school supplies at local Walmart.